31/60 Les Winan Too episodic for its own good, the second half of the film saps momentum from the brilliant start. The "aging" of the cast was distracting, but Ledger does stand out. 55/85 Kim Hollis Really overrated. 96/166 David Mumpower Overhyped, overlong and underwhelming. This is the most overrated critic's darling since American Beauty. As someone who tracks the movie industry for a living, I can honestly say that there are very few truly surprising announcements during a given calendar year. Most projects easily break down into one of a dozen familiar genres that we've all seen a million times before in one incarnation or another. Ang Lee is an auteur who seems to go out of his way to surprise in order to escape these molds. His first mainstream movie was the art house Jane Austen adaptation, Sense and Sensibility. Rather than move toward the middle with his follow-up project, Lee went with a Civil War drama starring a pseudo-eskimo musician named Jewel. Next up was the period piece, The Ice Storm, a movie whose central sequence involved a wife-swapping key party. He followed that one with Crouching Tiger, Hidden Dragon, a Shakesperean epic of romance and heartbreak which sprinkled in liberal amounts of wire fighting stunt sequences. But Lee was not done shocking people with his eclectic efforts and he then dove into the comic book world with his ambitious, but ultimately too-talky effort, The Hulk. In stark contrast to Ang Lee's prior efforts, The Hulk received a critical lambasting the likes of which the talented director had never witnessed before. Previously, no matter which odd direction he had veered his career, Lee had found critics all too willing to follow along for the ride. With The Hulk, the sucking up finally abruptly ended. Even worse, mainstream movie audiences piled on in such dramatic and emphatic fashion that the entire proceeding resembled a Rugby scrum. So, how does a man like Ang Lee choose to dust himself off and get back in the game? 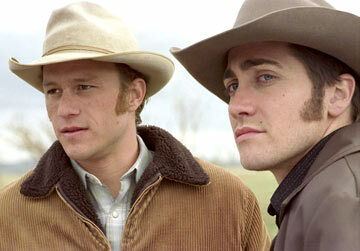 With Brokeback Mountain: a western......romance........about gay cowboys. You heard me. Gay. Cowboys. Oh, Ang, you are full of surprises. Based on a short story by Pulitzer Prize winning author E. Annie Proulx (of The Shipping News fame), Brokeback Mountain tells the story of Jack Twist (BOP fave Jake "Bubble Boy" Gyllenhaal) and Ennis Del Mar (Heath Ledger, a man still trying to prove 10 Things I Hate About You wasn't a fluke). The two previously straight cowboys meet at a ranch near Brokeback Mountain, Wyoming, and are surprised to find themselves falling in love.